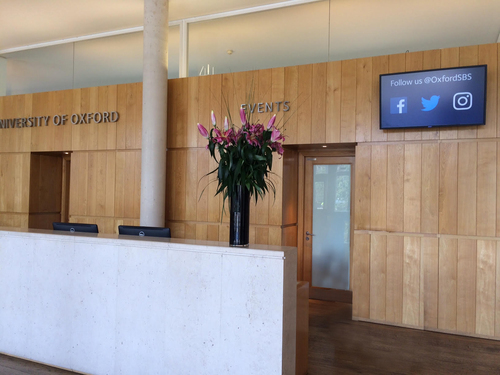 Saïd, the business school of The University of Oxford, has adopted the NowSignage platform to deliver the permanent signage around the campus. The screens are a mix of advertising, internal communications for students and social media content to improve the transparency through the business school. By mixing social media with targeted advertising, it makes for a much more engaged audience, which in hand makes for more effective advertising. An array of screens were setup around the campus to handle the different signage requirements and different messages they'd like to get across to the students. “Moving our digital signage to NowSignage ahead of the recent MBA Launch allowed us to provide essential library information for new students easily, and also provide consistency with other signage and branding at the Saïd Business School. Being able to update content through a web-based dashboard means that we are able to update content much more regularly and can react to information needs as they arise. With NowSignage being used across the school, it also opens up many possibilities for the reuse and sharing of content and social media." All screen casts are managed from the same project dashboard, making the upload of a variety of content extremely easy. Localising the information not only makes it accessible for the person managing the screens but it removes the crossover that often occurs in messages between students and staff.